• The aspiring poet needed to own (or have access to) a trotting broodmare. • The novice poet needed enough courage to write an eight-line poem, one that might show up in public. The contest proved to be great fun. The amount of participation was encouraging with over 60 poems, including several that arrived after the deadline. Diamond Creek accepted the submissions. A local writing group, a group that did not know a trotter from a slice of tiramisu, selected the winning poems and enjoyed learning about our little sport. Last week brought an update from the winner, Lisa Dunn. Obviously, the story of Pure Poetry is far from complete. We all know the road to the winner’s circle is long and many things can happen along the way. However, a beautiful young filly from a well-bred broodmare is a great start. my grandest foal, God said. Nor think the labor vain. Let’s cross our collective fingers and hope that Pure Poetry has a long run, which she is poetry in motion on the racetrack and that she races like the wind. What a wonderful story that would make, a story that would be of interest to audiences outside of our small little band of enthusiasts. A poem that evolved into a magnificent animal would make a magical tale (tail). A good story such as Pure Poetry can be gold. A good story with a happy ending can be purer gold. Editors and digital producers in any genre are always looking for stories with legs and reach. This one would have both. A good story can break out into the big wide world. Pure Poetry could be a viral sensation. Poets might flock to watch her race. Who knows what doors opened with a horse, a dream, a contest, and prize money presented in a favorable light? In addition, good stories often have sequels. Another contest is in the early planning mode. 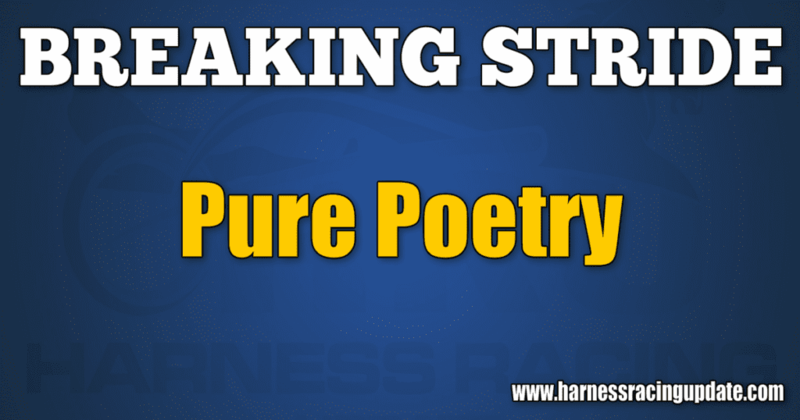 Should the pieces fall into place, a sequel to the harness racing poetry contest might just be possible. This sequel would be literate, but not poetic; a contest the likes of which you have never seen. Many will laugh and a few may scoff. Keep your pencils and your wits sharp. Who knows what state, what sire, or what farm might be available. Who knows what madness lies ahead. Like Pure Poetry — one step at a time.